Shinobu Wakamiya, the reigning Queen. With episode 24 of Chihayafuru season 2, the national high school tournament is almost over. I think I understand now why they wanted to pace this season as they did. The one thing we have left to find out is how Tsutomu “Desk-kun” Komano did in his match. It wasn’t quite a sweep, but Mizusawa High did quite well in the individul matches, taking first place in at least two, and possibly three ranks outs of four. If there are 25 episodes planned the final episode can be dedicated to the reveal of Tsutomu’s outcome and an emotional closing ceremony. 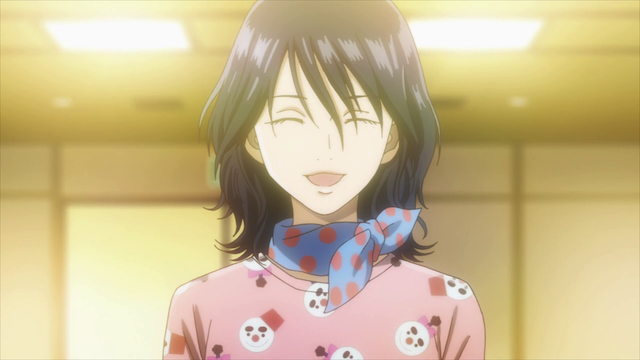 The first season ended with Chihaya’s regret that they would spend the next year as losers. This time we end the season with them having taken the national championship as a team, as well as several of the individual titles. In addition, we have some nice rank advancement, as was discussed briefly at the beginning of this episode. We also have some cool things to look forward to if any more Chihayafuru seasons (or movies) get a green light. There is the upcoming Meijin tournament (probably best tackled as a season unto itself) as well as the promise of Arata moving to Tokyo. there should be a new season. there’s so much more to show. the meijin tournament, arata’s impending move back to tokyo. and the showdown between chihaya and taichi since chihaya now sees him as a rival. hahaha!!! Yes! Season 3. I’m on board. Chihayafuru manages to pace so well, considering how “slow” the progression can be at times; even if a single match takes up three or four episodes, your attention is captured in every moment. This is partly due to how wonderful their characters are and how skillfully they develop these characters – even the less important, non-main characters (even when Sudo does nothing, I love that he’s just there). I suppose, if they got another season, they would focus on the road between the end of the high school tournaments, either up to, or including the Queen and Meijin tournaments. I wish the end of this season would provide some indication as to whether or not we can expect a third season! AND, worse come to worse, if there’s no third season, there’s always the manga! I agree that the Queen/Meijin tournament is a big enough topic to be the focus of an entire season at this point. It took a while to find out about the second season, so if we don’t get an immediate confirmation for a third, I will still be hoping for one.